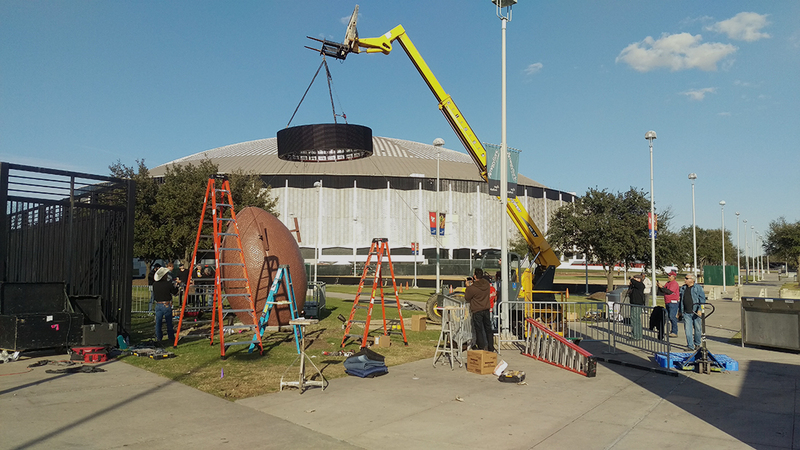 Staging Solutions was eager to accept the challenge of designing and installing Super Bowl LI countdown clocks around the City of Houston, which would operate for one year to build anticipation and increase awareness of Super Bowl LI. We were tasked not only with satisfying the technical demands of the clocks themselves, but also addressing the legal demands of the City of Houston and the climactic demands of southeast Texas in a compelling and aesthetically pleasing way. 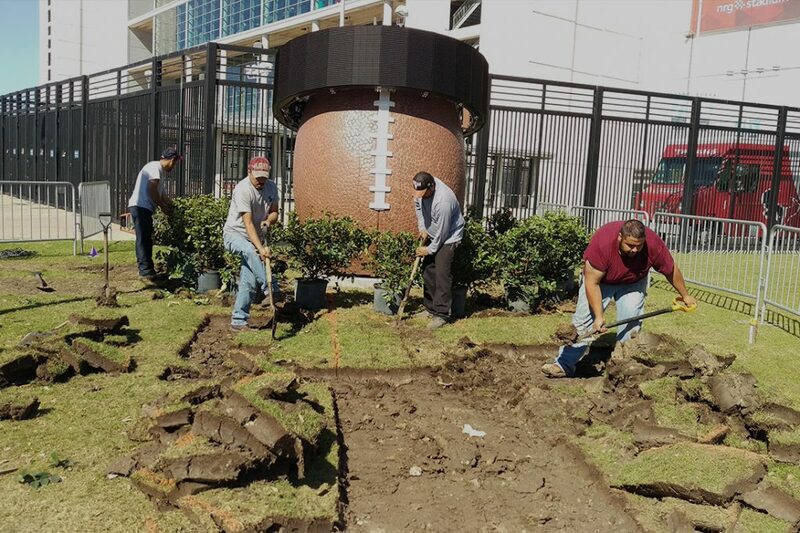 The clocks were to be installed in four locations around Houston to reach fans everywhere. 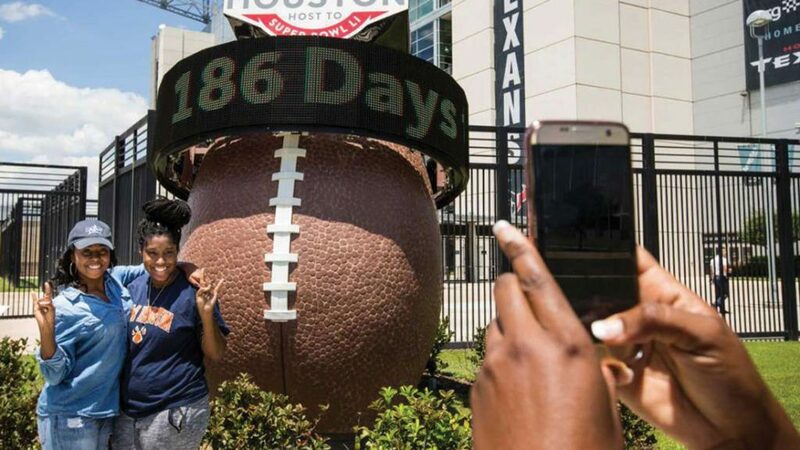 When the concept of a countdown clock was finalized with the Houston Super Bowl Host Committee (HSBHC), our task was at hand. 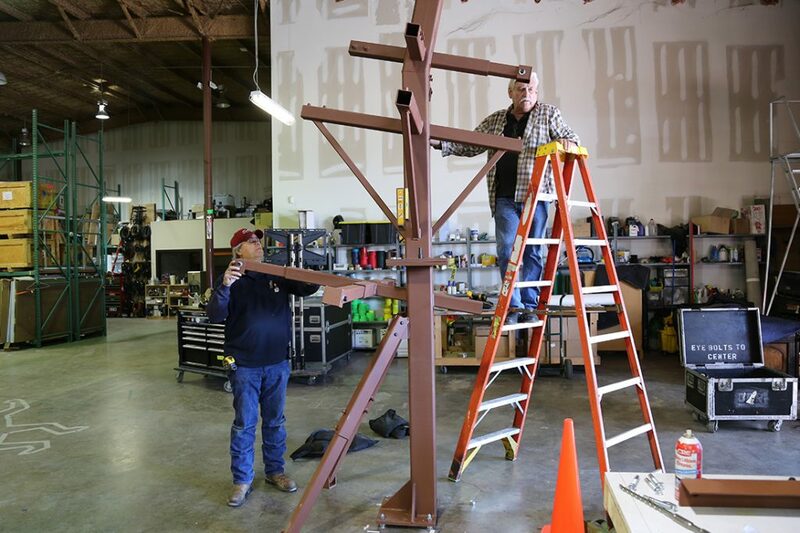 We designed the structure, and provided services for site layout and consultation for each location, including soil samples, water table evaluation, base design and construction, lighting, landscaping, installation, removal, and restoration of the locations. Staging Solutions classified the structures as permanent installations, and secured permits for tornado and hurricane specifications, electrical, signage, structural engineering, and civil engineering (by location), and worked with the Mayor’s office to expedite the paperwork. 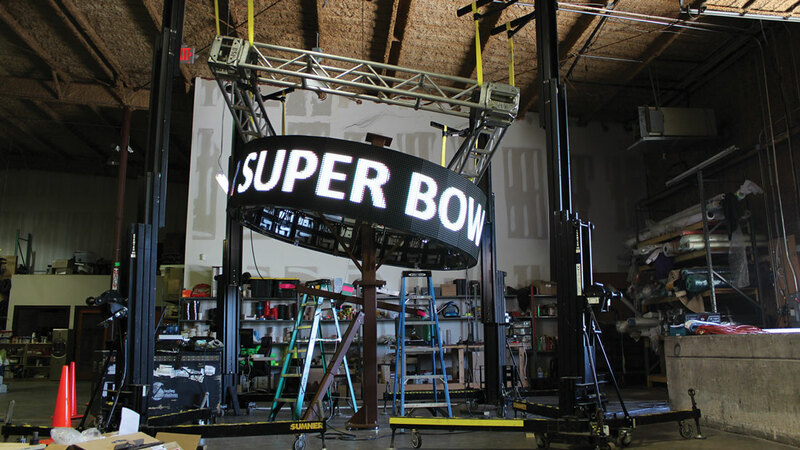 Fabricating the units themselves required design and construction of load-bearing steel infrastructure, signage, lighting, a custom-built LED halo for messaging, and a beautiful faux pigskin exterior for these 15’ structures. Does that sound like a lot? It is! And that’s just the beginning! The clocks needed not only to count down the days to Super Bowl LI, but also to accommodate messaging for 100 days prior to the Super Bowl event, Game Day messaging, and a Thank You to volunteers. Dave Lawson, our VP of Technical Services who is an electrical engineer with 7 years’ experience working at NASA Johnson Space Center, led the design team. He did thermal calculations to determine air displacement for cooling the computer within each statue, combatting both heat and humidity. A computer rated for extreme temperatures was selected, and custom programming for the various messages was written in-house. 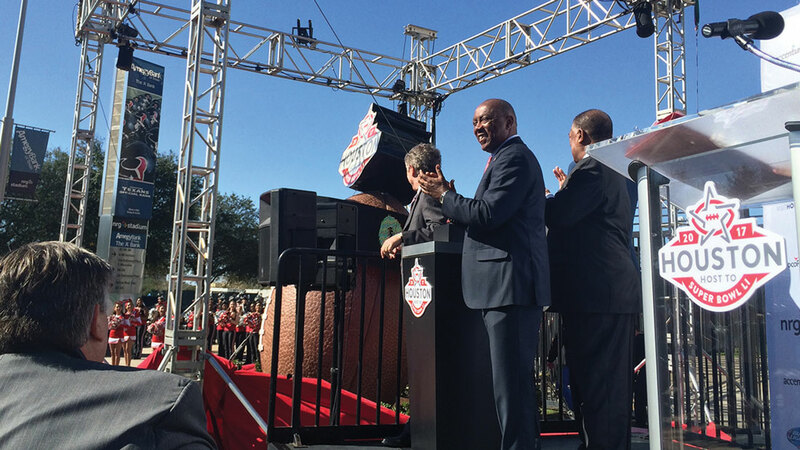 Once the clocks were built, programmed, and installed, Staging Solutions produced events to celebrate these unofficial symbols of Super Bowl LI, including the press event/unveiling ceremony at NRG Stadium that welcomed the HSBHC and the Mayor of Houston, Sylvester Turner. Throughout the year leading to the big event, the clocks fulfilled their mission of building anticipation and increasing awareness, becoming the backdrop for countless selfies and social media posts, local and national broadcasts from on-location reporters, introductions and teasers, and myriad other activities. 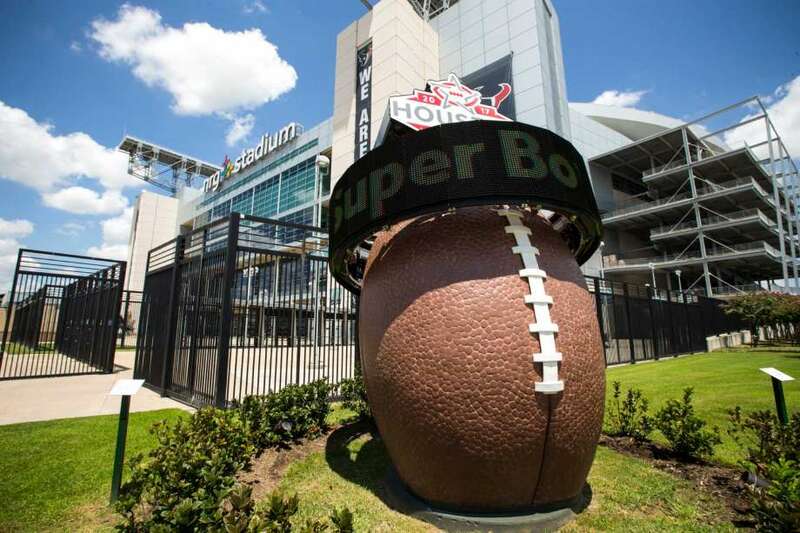 In their locations at Hobby and Bush Intercontinental Airports the clocks welcomed guests and branded the city as the site of Super Bowl LI, and at Discovery Green the clock delighted visitors and served as a constant reminder of the festivities to come at Super Bowl Fan Central. 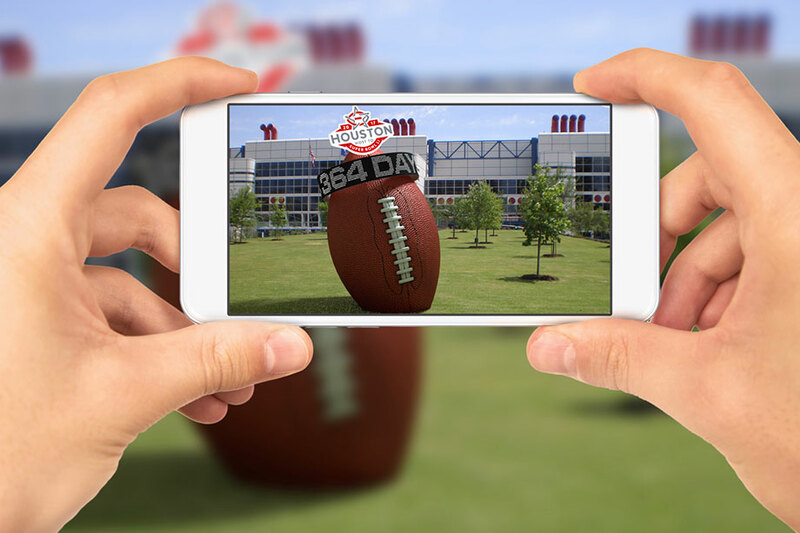 The Super Bowl LI countdown clocks quickly became an icon, featured throughout news and sports media and in a plethora of selfies and social media posts.